Increased populations have placed incredible stress on finite land resources needed to grow sufficient food to feed the world. Repeated planting and harvesting has depleted soil of necessary nutrients. Fertilizers have filled that need by providing growers simple, easy to acquire ways to reintroduce essential nutrients. Fertilizer boosters supercharge the plant reproductive cycle, which actually reduces the amount of fertilizer required to fully nourish the plant. This translates to less cost to the grower and fewer chemical impacts on the environment and on people. If fertilizers are so great, why does a grower need fertilizer boosters? That’s a fair question. The answer is that fertilizer boosters work in the plant itself to make more effective use of the added nutrients provided by fertilizers, thus reducing the amount required to achieve optimum yields. Boosters actually improve the absorption ability of the plant itself by helping it to more efficiently process nutrients and water, which means the plant’s roots, stalks and leaves are strengthened, promoting higher quality and higher production yields. Because fertilizer boosters like BioWash are inexpensive to apply, they reduce the amount of fertilizers needed while actually promoting improved crop yield. Growers are finding they actually save money by adding good fertilizer boosters like BioWash. For example, a Louisiana tomato farmer reported reducing his fertilizer cost by 80% and yet enjoying his greatest tomato yield ever achieved! He also found that his tomatoes were virtually insect-free without the use of insecticides. Cationic Exchange (CE) is a scientific term to describe a very simple process in plants. CE is a process that stimulates the electromagnetic exchange between a plant’s root and nutrient ions of the soil. In soil science, cation-exchange capacity (CEC) is the maximum quantity of total cations, of any class, that a soil is capable of holding, at a given pH value, for exchanging with the soil solution. CEC benefits plants by increasing their root size, allowing greater absorption of nutrients and water (critical in arid land areas). This, in turn, encourages increased BRIX (sugar content) production in the plant, which helps enhance the photosynthesis effect of the sun’s rays. The outcome is faster growth and maturity, healthier and sturdier plants with improved produce flavor and yields. Additionally, the increased sugar content discourages those many insects that cannot digest sugar, thus reducing the cost and health hazards associated with insecticides. Individual profit increases will vary due to different markets and situations. Anecdotal reports by growers using BioWash have reflected as little as 20% increased yields to as much as 1000% increased yields and profits. Growers are also reporting increased profits stemming from reduced need for fertilizers and insecticides. Reduced freeze damage alone could save a season’s income. The general consensus reported by growers using BioWash is that it actually improved their profits. The benefit comes from the reduced need for fertilizers (they aren’t cheap) and the low cost of using boosters themselves (BioWash costs approximately $5/acre to apply). Growers report faster maturing plants, earlier to market crops and higher quality produce. Problem solved! Field reports and testimonials from BioWash users reflect doubled and tripled yields following application of this fertilizer booster. One farmer in Iowa in 2009 sent photos of his BioWashed soy plants, showing them producing triple the normal number of nitrogen pods and double the amount of soy beans. 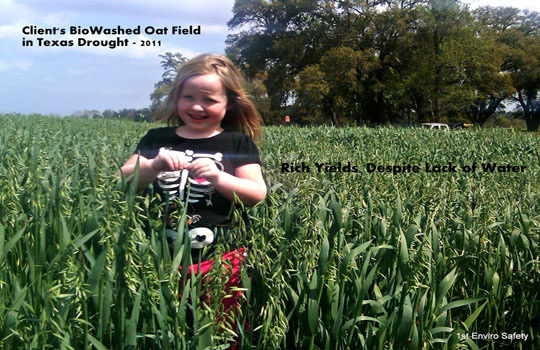 While most crops were devastated by the 2011 drought in Texas, a BioWash user reported that his BioWashed oat fields out produced previous crops and raised protein levels in the oats to 26% (average is 8-10% protein). His neighbor’s oats were too sparse to harvest, so they opened their fields to cattle. BioWash produces healthier crops, earlier market harvests and increased yields ….. all of which translate to increased market returns. It’s a slam dunk! By making BioWash a regular part of your crop planning efforts, multiple benefits can be realized. Less fertilizer is needed, translating to less dependence on harmful chemicals. This reduces negative impacts on the soil, on our environment and on people, as well as less cost to the grower. Improved growth and stamina in plants means healthier, sturdier, more disease resistant plants; earlier harvests and exceptional crop quality and yields. The higher sugar content discourages insects, thus reducing the costs and health hazards of insecticides. The ability of BioWashed plants to resist freeze damage actually saved an entire annual income for one citrus grower! BioWash is 100% biodegradable and contains absolutely no carcinogens. A winning deal for us and the planet!